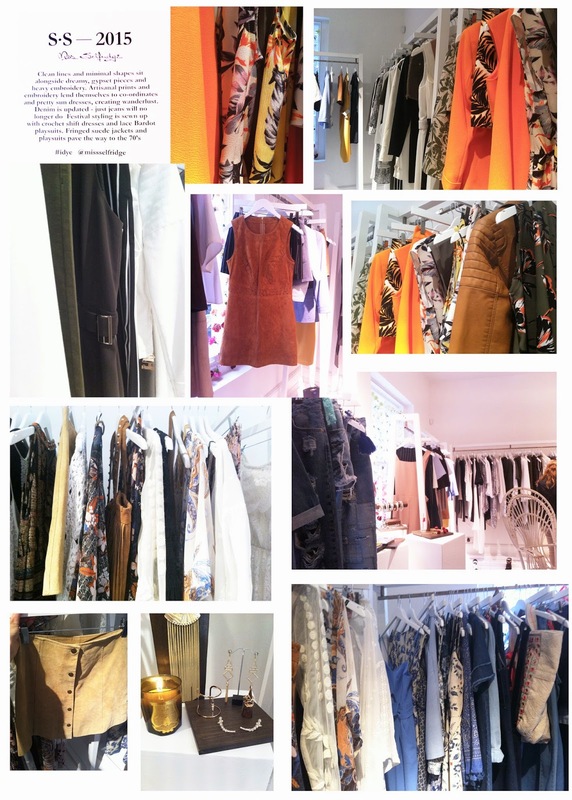 Last week I went to the Miss Selfridge SS15 launch to see what's to come and to have some fun with tie dye. As it was my first press event I was super nervous, but all of the Miss Selfridge staff were really friendly and I couldn't wait to browse the collection. SS15 will see the return of the 70s style and initially I was unsure, not convinced I could ever pull off flares and bright colours. But Miss Selfridge have persuaded me, their suede pieces instantly drew me in. Skirts, dresses, playsuits, jackets- you name it, they've done it and they really deliver on quality too! I can't wait to buy the super cute brown suede dress, perfect for Summer. There was also some amazing white minimalist pieces to fulfil the simple and chic vibe we all aim to achieve come Spring/Summer. Paired with khaki skirts and pinstripe trousers, it's impossible not to nail minimalism this season. If you prefer to wear bright colours when the sunshine comes, vibrant oranges and yellows come teamed with grey, white and khaki, creating an exotic and warm story. Much of these brights come in gorgeous jacket and short co ords and cute crop tops, ideal for holidays! For those of you more into the boho, festival vibes, Miss Selfridge have a huge selection to set you up for the season. There is plenty of paisley prints, fringing and tassels and sheer, embroidered kimonos. Crochet, suede and crepe take the form of jumpsuits, dresses, culottes and skirts and a fave of mine is a black crochet dress, perfect as a poolside cover up or partying at a festival. As if we needed any more, Miss Selfridge have also massively upped their denim game. Dresses, patchwork boyfriend jeans, button up skirts, shirt-dresses, and hot pants- we couldn't ask for any more. I love it all, and having seen bloggers Liv Purvis and The Little Magpie wearing the belted shirt dress I'm definitely hoping to get my hands on it! Speaking of belts, they're set to be popular for SS15, both D-ring tie waists and buckled belts, they'll flatter your waist and add depth to otherwise simple outfits. I have my eye on a khaki wraparound top. And for anyone heading to a ball or special occasion, MS continue to offer their stunning sequinned and embellished dresses, long and short to ensure you stand out from the crowd. Alongside the selection of beautiful clothes was a really cool tie dye set up. We had the opportunity to choose an item of clothing (boyfriend jeans, skinny jeans, t-shirt or handkerchief) and then pick yellow, blue, green or khaki dye to customise our pick. I went for a pair of white ripped boyfriend jeans, and aiming for a simple and clean look I opted for a simple dip dye into the blue. We were taught by a really friendly team what to do and it was great to be hands on! I can't wait to have my finished jeans sent to me and wear them this Summer. I'm sure you'll be seeing them on the blog as soon as I get them. All in all, Miss Selfridge have nailed SS15! The collection will be arriving in store and online from now so keep a look out for some amazing items and get spending. I know I will! I hope this will have given you an insight into what to expect and key pieces to focus on.